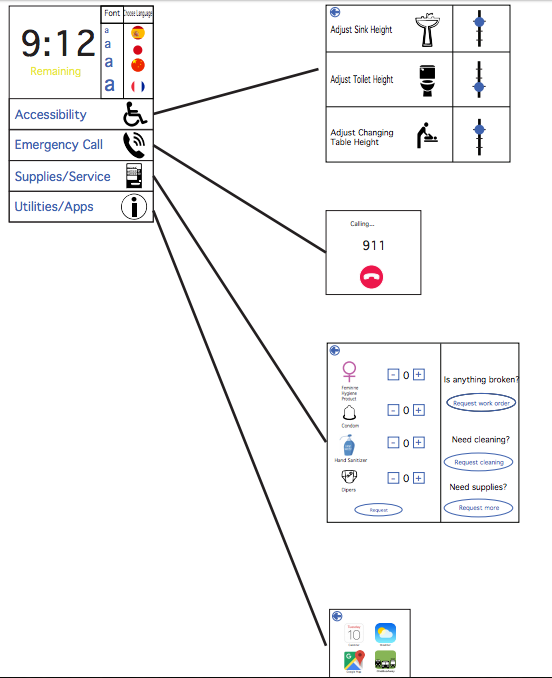 This group project on bathroom accessibility was created for a User-Centered Design class at the University of Washington. The Ave is a street hosting a mix of restaurants, stores, and people – students and neighborhood residents alike. As bumbling as it is, it lacks certain resources such as public restrooms. People often resort to using restrooms inside shops; however, many store owners only allow customers to use their facilities. This poses an inconvenience to many patrons, including the local homeless population who can’t dole out cash for basic access to a restroom. Where public restrooms do exist, they are often places of criminal activity, loitering, and uncleanliness. 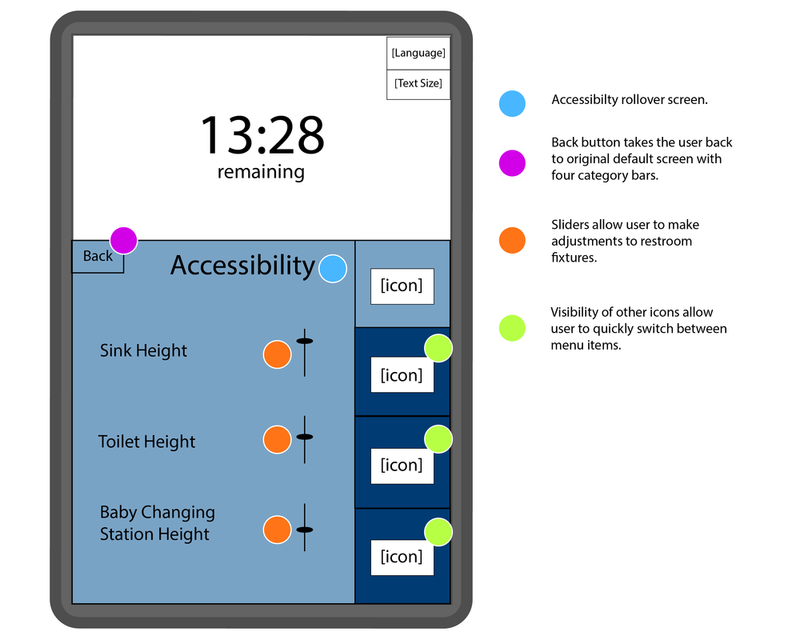 Our set of restroom screen interfaces aims to bridge this gap and make public restrooms more accessible and safe to use. To address the problems surrounding public restrooms, we surveyed a broad spectrum of people who frequent The Ave, and asked them what kind of public restroom features they’d like to see implemented. Taking this information, we organized these features into two main categories: hygiene resources and safety resources. We then broke these two categories down into smaller needs people might have, and brainstormed different ways we could satisfy these needs. We created personas using our surveys with the public to represent different stakeholders who might be influenced by our solution, including UW students, the local homeless population, and neighborhood families. The persona to the right is of Peter Anderson, a local homeless man who lacks hygiene resources. 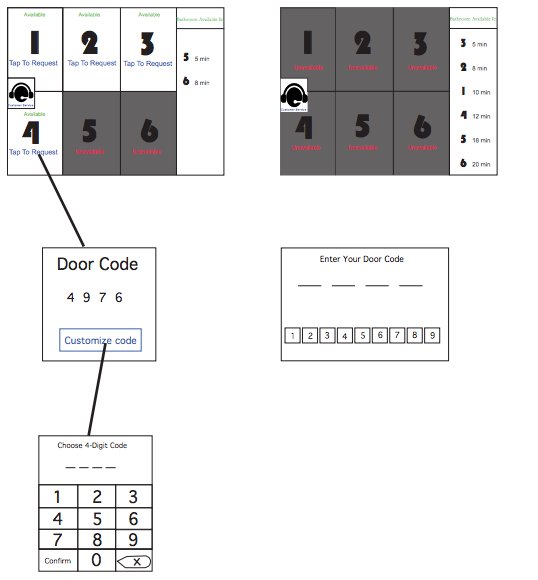 In trying to create a solution that would improve the quality of public restrooms, we decided on a two-part interface solution. The physical nature of the restrooms would be a compound of individual restroom “rooms”, not just stalls. A user would have complete privacy within one of these rooms, as well as a sink, toilet, shower, diaper changing table, and a toiletry vending machine. Our first interface resides inside an individual restroom, allowing the user to interact with and adjust amenities. The second interface controls the compound of restrooms, allows the user to view restroom availability, and select one restroom for their use. 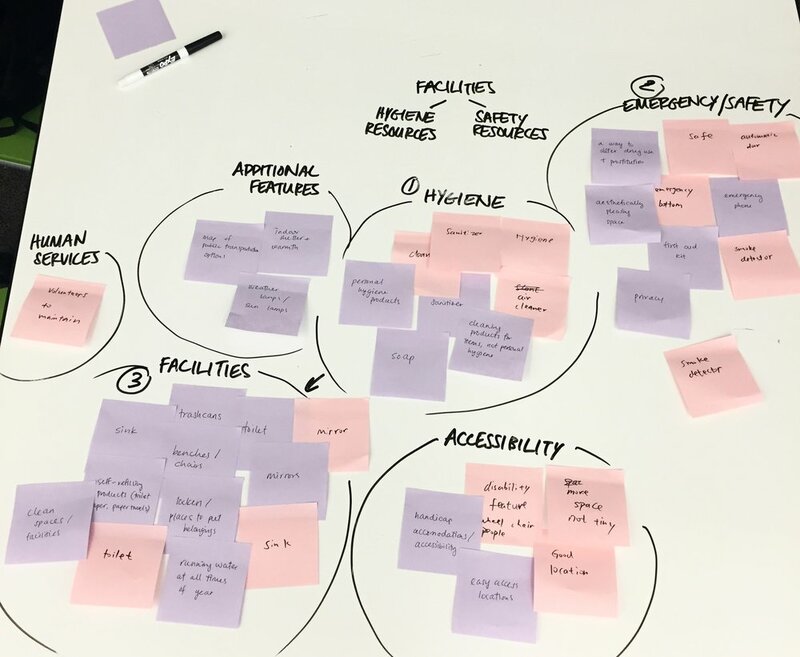 Our user research and personas lent us insight on what aspects of restrooms are most important to users, and what features they'd like to see implemented. 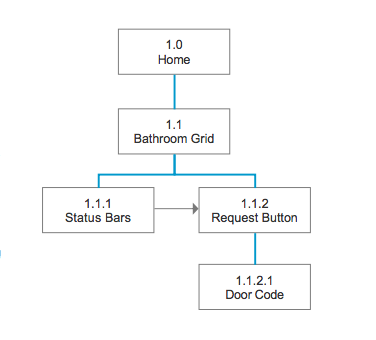 Our sitemap represents the hierarchy of the features we have included in our two interfaces. With our sitemaps in mind, we created several scenarios, product sketches, and storyboards to inform our prototypes, and the final version of those prototypes are shown below. These prototypes, initially printed out on paper, were tested with the surrounding public to gauge ease of use. After testing, we converted our paper prototypes into digital wireframes, mapping out the layout of our interfaces.